We planned to catch the 6:15 train from Kings Cross Station to Durham because we were quite mad. Actually, Erika had originally planned to fly Newcastle and I had bought my train ticket to coincide with her arriving in Durham. I was really looking forward to having a Top Gear-like race to see which of us would arrive at our destination first. As it turned out, Erika decided it was less hassle to take the train with me. 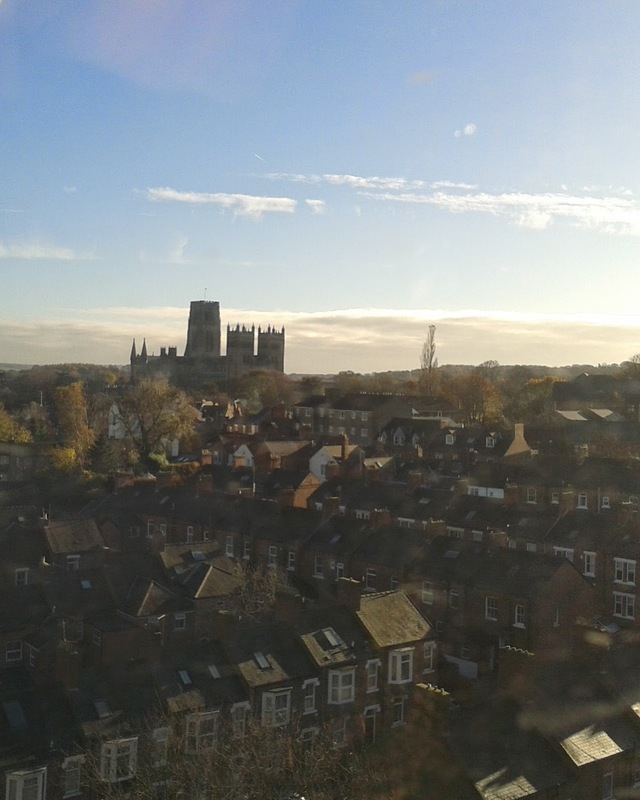 The best view of Durham is from the train. The cathedral and castle explode into view from the southern tracks after coming through a thickly wooded patch. It is quite breath-taking and I highly recommend taking the train into Durham always. We arrived in Durham in time for a two day deluge. It was really maddening as I had hoped to take Erika on my river walk and through the botanical gardens. Unfortunately it was not to be. After dropping our things off in my room and introducing Erika to the space pod bathroom, we decided to head into town for some lunch and a castle tour before heading to CrossFit that evening. There was only one place to take Erika for lunch in Durham: Treats. It’s a tiny, second-floor tea shop with amazing quiche, sandwiches, soups, and baked goods. I usually end up at Treats when I’m in town with friends. It’s the type of place which endears itself and the prices are right. We headed up to Palace Green to try to take the 2:00 tour of the castle. I had completely forgotten that it was half-term. The tours were completely booked. I reserved a spot for us the next afternoon and we wandered over to the Cathedral hoping to make it in time for the tour there. We were in luck. After paying our £5 fee we joined a small group of people sitting in the pews with a man in a red robe who would be taking us around. I hadn’t done the Cathedral tour before and I learned so much about the gorgeous building that had been at the centre of my city for the past eight months. The ancient stones seemed to take on a deeper meaning and I found that some things that had blended into the background were now standing out so blatantly that I was shocked I hadn’t noticed them before. After our amazing guide, who took an hour and a half to show us every little detail and who was genuinely delighted to be showing people a building he obviously loved so much, was finished I took Erika out to see the cloisters. It was fun to show her a place where Harry Potter was filmed and show her the fake wall that the production team had left in place. We went over to the gift shop and decided to build Durham Cathedral. If you visit Durham, make sure you go take a look (and maybe participate in) the building of the scale Lego version of the Cathedral just off the gift shop. It’s pretty amazing and should be going on for at least another three years. When finished it will be 300,000 bricks, 3.84 metres in length, 1.53 metres wide, and 1.7 metres high. Each brick costs £1 and the money raised goes toward the Open Treasure project which goes to improving access to the Cathedral and its collections. Bottom line: it’s a pretty cool project. By the time we finished up at the Cathedral it was time to take the bus to CrossFit. Now Erika is an avid runner. She’s done marathons, half marathons, and had just run a 10K a few hours after stepping off a plane. She’s never done CrossFit before, though she has lifted in the past. I was excited to get the chance to introduce her to something I really enjoy and had gotten me into the best shape I’ve ever been in. I had been thinking about CrossFit since the St. Paul’s climb the day before. In the past, that climb would have completely wiped me out; in my life since starting CrossFit, I was more than capable of completing a tough climb like that one. It was a pretty tough WOD that night, 15 Clean and Jerks on the minute every minute increasing the weight with each successful lift followed by 50-40-30-20-10 kettlebell swings and sit ups. Our abs were well and truly exercised. I’m not sure I convinced her to sign up for CrossFit back home, but for the rest of our trip we compared all of our excursions to WODs. The next day we could not get out of bed. It wasn’t that we were tired; we actually couldn’t physically sit up without our abs burning. DOMS had hit (delayed onset muscle soreness). The WOD from the evening before had struck silently in the night and for the next four days laughing, coughing, sitting up, and lying down were painful endeavours. We had a slow morning. They weather had worsened and we were not looking forward to wandering around town much before going on our castle tour. The night before Erika had agreed to help me pick out new trainers as the ones I had been using for CrossFit and running were…inadequate. (That’s a nice way of saying, I was lucky not to have debilitating shin splints.) Around one, we took the bus into town and hurried through the cold, wet streets to Start Fitness. With Erika’s guidance I was able to find a great new pair of trainers and they weren’t even disgusting pink and purple colours. We celebrated with another trip to Treats where we both tried some of the sweeter selections on offer. We trekked up to Palace Green once more for our tour. The castle tour isn’t a bad way to spend forty-five minutes but it’s much better in the dry weather, at least for the first bit. Both times I had gone it had been raining and the first ten minutes are outside in the courtyard. Maybe one day I’ll go when it’s sunny. It’s not an extensive tour; you see the main foyer, the kitchens, the Great Hall, the staircase, the Tunstal Gallery and Chapel, and the Norman Chapel. This last stop is the best part of the tour. It is a brilliant, dark, ancient place. The stonework is truly beautiful and quite unusual. It’s home to the first depiction of a mermaid found on one of the column capitals. No one knows why it is there. The tour is worth it to be able to see this space. After the tour we decided to take in evensong at the Cathedral. I was anxious to share the pure sound of the Cathedral Consort of Singers. We were seated in the choir and both of us took the opportunity to further examine some of the highlights from the previous day’s tour. Finally the grand organ took up a haunting tune and the procession of clergy and singers arrived. They were not what I expected. I looked at the programme and to my utter disappointment discovered that the Cathedral Consort of Singers would not be performing that evening. The first chord struck by the choir was painful as was the second, third, fourth, and so on. The sopranos screeched every single note. We were trapped. We couldn’t leave. We had to endure. Endure we did. On the way back to Howlands I think I apologised one hundred and fifty times. Our musical evening was only just beginning. I had decided to hold rehearsal for the Ustinov Choral Society. We were gearing up for our final performance at the Ustinov Barbeque in June. Erika joined the alto section and we managed to get our piece in pretty good shape. After rehearsal we adjourned to the pub where the drinks and conversation warmed those of us who had spent the cold, rainy day out and about. The next day Erika and I would be off to Scotland.